Arugula perks up mixed salads with its nutty, peppery taste and makes a wonderful salad on its own combined with shaved Parmesan cheese. Astro has strap-shaped leaves, less deeply lobed than many, with a milder flavor. Slow to bolt, it still prefers the cold soil of early spring and fall. Resow at 2-3 week intervals from mid March through April and again in September. Harvest with scissors as a "cut and come again" crop. Our supplier's selection of the heirloom 'Forellenschluse' (meaning "speckled like a trout's back") is richly speckled with bright red splashes on bright green leaves. 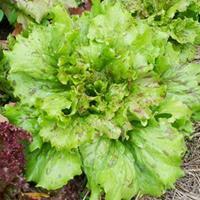 This Romaine variety has crisp, butterhead-like texture and sweet flavor. Best in cool weather in rich, moist, well-drained soils.